When will be New Journey to the West next episode air date? Is New Journey to the West renewed or cancelled? Where to countdown New Journey to the West air dates? Is New Journey to the West worth watching? 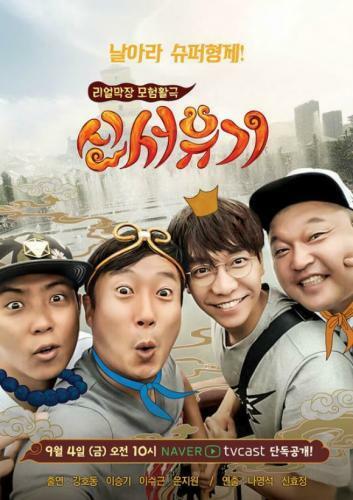 The show re-unites 2 Days & 1 Night Season 1 members Lee Seung Gi, Kang Ho Dong, Eun Ji Won, and Lee Su Geun. The four members each take one of the characters from the classic Chinese novel "Journey to the West" as they go on a 5-days and 4 night backpacking trip through Xian, China, to play various games. New Journey to the West next episode air date provides TVMaze for you. EpisoDate.com is your TV show guide to Countdown New Journey to the West Episode Air Dates and to stay in touch with New Journey to the West next episode Air Date and your others favorite TV Shows. Add the shows you like to a "Watchlist" and let the site take it from there.